Our belief is that communities and their residents have the best knowledge and ideas for their future. Our job is to bring the tools to help them express and implement their vision. Community Workshops: Fregonese Associates specializes in creating interactive workshops that harness the “wisdom of crowds.” Our workshops allow the public to share their best ideas in a fun, creative and social setting. We custom-design each workshop “game” and materials, and work closely with staff and stakeholders to present opportunities and trade-offs. 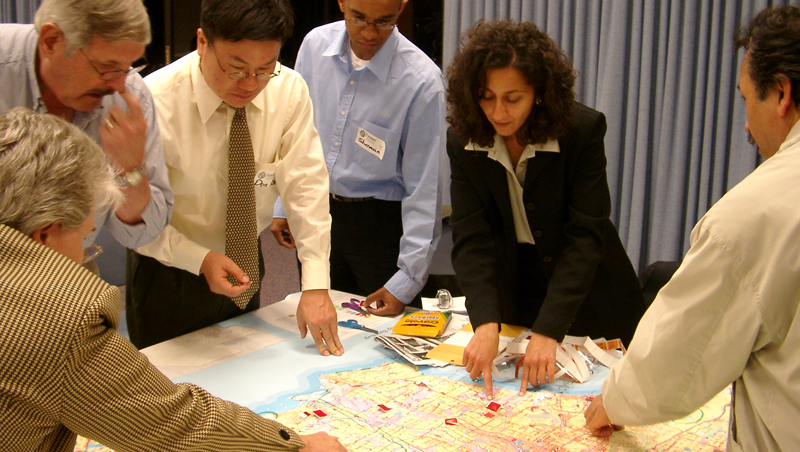 Workshops have a lively atmosphere with tables of six to eight citizens gathering around a large table-sized map, experimenting with different visions for the future of their neighborhood and city. Bringing many different people into the “crowd” – whether from different neighborhoods, ages, life experiences or outlooks – strengthens every plan. Visual Preference Surveys: Visual preference surveys are useful in finding what kinds of urban designs are viewed positively in the local area, and which are viewed negatively. In addition, the effect of landscaping and open space can be judged, by adding these elements to the same image. The reaction to a streetscape with and without street trees, for example, can then be assessed. Results are used immediately to develop a series of guiding principles that direct the entire visioning and planning process and accompanying evaluation criteria. Live Polling: We have had success using live polling with handheld clickers at workshops and meetings, which provides exciting instant feedback for the participants. Each person answers the question on the screen anonymously using their clicker and the results of the entire group are posted on the screen instantly. The answers inform our process as well as let participants know what their neighbors are thinking on community issues. Social Media and Website Management: Our team of planners and outreach specialists has experience in a broad range of social media and online engagement techniques. From managing a planning effort’s Facebook and Twitter presence to creating an engaging website from scratch, Fregonese Associates offers a range of tools to help increase project awareness and engage stakeholders. We have created project websites for public sector clients large and small and have overseen branding efforts for a range of projects. No matter your community’s needs, we have the expertise to broaden the reach of your planning project through its web presence.